Shortly after the time we found out that we were to expect a baby at the end of the year, my grandfather died of a heart attack. My grandfather, or ‘Papa’ as us grandkids called him, had dreams of an art career in his youth, but the Great Depression and the demands of a growing family made it necessary to find more practical employment, yet he continued to throw his creative impulses into his everyday life, through creative carpentry, and an oil painting hobby (I still have his homemade art painting box where I store my own oil paints). I wish he could’ve lived to see me on my feet as a freelance artist, and I like to think he would’ve gotten a certain amount of satisfaction out of it. 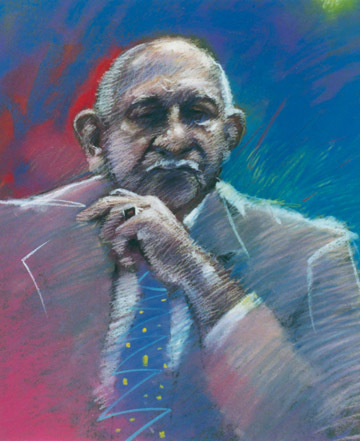 I did this pastel portrait of him shortly after his death and it still hangs in my grandmother’s bedroom (she eventually passed away at a ripe old age of 101 many years later). I have many fond memories of summers spent at their Whitefish Bay cabin on Lake Superior near Paradise Michigan (me and my brother were usually shipped up there for the last half of the summer to escape hay fever allergies), and of wild blueberry picking and hunting for agates on the shore. The first mailings I sent out were single folded brochures with black and white on one side, and a color image on the front. I used the same color self portrait on a couple different versions of this mailer, saving on printing by reusing the same ‘back’ and then imprinting different black and white on the back side. This portrait I had done the previous year as part of a life drawing class assignment, and it would also be picked up the next spring by an ‘artist how-to’ magazine as an example of pastel portraiture techniques. Obviously I am completely floundering around looking for a style, and have included everything but the kitchen sink on these brochures, and most of it pretty amateurish. Surprising I ever got any work out of these, but according to some notes that I had scribbled on the back of the samples, I did get a few confirmed bites from these early mailers. The interesting thing about the first one, is that it contains a piece of artwork that is the only surviving image from my two years of art school (the contour line drawing of the ‘drum corps cadets’). 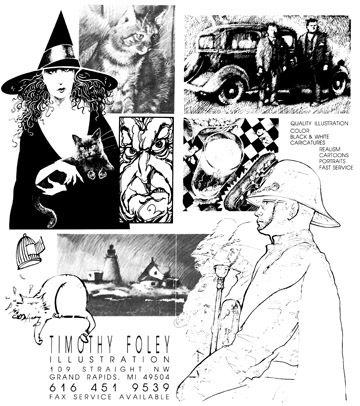 I also included a few black and white halftone photos of some of my pastel work (the cat and the lighthouse can be seen elsewhere in this blog), one of my earliest attempts at scratchboard illustration, some bizarre line and cartoon doodles, and a couple of intricate looking stippled drawings that I really don’t remember where they came from (the witch and the hot dog/beer art) – they might be more college work, but I’m also thinking that they look somewhat inspired by clip art samples that we were starting to get at work through the ‘dynamic graphics’ company – and I might have been thinking I could get work as a ‘clip art’ illustrator. 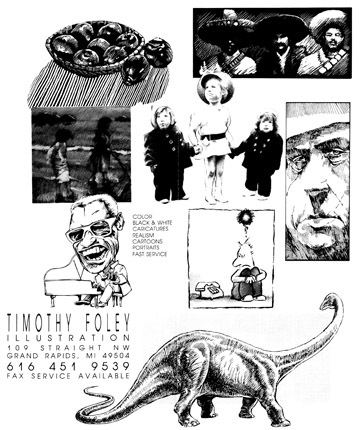 The second mailer was more of the same, a lot of conflicting styles and approaches, including a pencil drawing, a caricature and some crosshatch line art. The black and white halftone of a pastel on this brochure was from a large color piece that I had given to my brother in law to decorate his office, and which I haven’t seen in many years (but is apparently still hanging there). Looking back from two decades in the future, these old mailers really make me cringe, but there is a little consolation in the fact, that I probably only sent about a couple hundred of each of them out, so they probably weren’t seen much. I also seem to remember sending out a couple ‘caricature’ brochures, one of them featuring a crowd of famous authors, and another one of mixed celebrities. Neither survive.